Artwork of the three primary Candypop Buds. 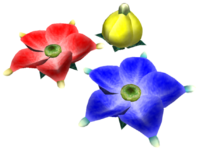 Candypop Buds are large flowers with fleshy petals and are found in all three Pikmin games. When Pikmin are tossed into these gigantic blossoms, they spit out new Pikmin seeds which match the color of their petals. These new Pikmin are born in the leaf stage. The Candypop Buds expel the seeds after five Pikmin are thrown in, or a few seconds after the first throw. The exception being the Queen Candypop Bud, which does so after the first Pikmin is thrown. In Pikmin, Candypops will wither after 50 Pikmin are thrown in, but this number was reduced to 5 in the second and third games. In these two games, using Pikmin of the same type as the flower does not count against this limit, although they will still be reverted to leaf Pikmin and planted in the ground. In Pikmin, Yellow Pikmin holding bomb-rocks will not be taken in by Candypop Buds, merely sliding off the top; the same will happen to thrown leaders in Pikmin 3. However, in Pikmin 3, if a Pikmin holding a bomb rock is thrown in a Candypop Bud, it will extend upwards before wilting away, killing the Pikmin with it without leaving a spirit behind. In Pikmin 2 Candypop Buds are never found above ground and only appear in caves, where they will respawn when the cave is reentered. In some caves, Violet Candypop Buds and Ivory Candypop Buds will only appear if the player has less than a certain number of Pikmin. In Pikmin 3 they have a different appearance, consisting of a large bucket-like cup in the middle of the flower, most likely as a "target" for leaders to aim Pikmin at. They also behave slightly differently, as they are always closed, opening only when a leader is nearby, and when they wither, their roots remain in place. Also, if two players throw Pikmin in a Candypop Bud at the same moment in Bingo Battle, the Candypop Bud will spit out seeds for both teams, depending on the number of Pikmin that were thrown in by each of them. To unlock a Candypop Bud's entry in the Piklopedia, the player must throw at least one Pikmin inside and wait for a seed to be spat out. Main article: Crimson Candypop Bud. When Pikmin are tossed into a Crimson Candypop Bud, an equal number of Red Pikmin seeds are spat out. Proper planning lessens the need for these flowers, but they are more useful if one is far from the Onions and has a small number of Red Pikmin on hand. Main article: Golden Candypop Bud. Golden Candypop Buds release yellow seeds when Pikmin are thrown in. While large numbers of Yellow Pikmin are not often needed, use of the Golden Candypop is required to obtain the Chronos Reactor in Pikmin. This particular Candypop Bud is unfathomably rare in Pikmin 2, making only one appearance inside the Glutton's Kitchen on sublevel 3. In Pikmin 3, Golden Candypop Buds often appear near electrodes. Main article: Gray Candypop Bud. Gray Candypop Buds spit out Rock Pikmin seeds when Pikmin are thrown in. Gray Candypop Buds are uncommon in Story mode, but a cluster of four appears in the southernmost region of the Tropical Wilds, where a Calcified Crushblat awaits. Since only Blue Pikmin can reach the Crushblat, these Candypops are useful to attack the Crushblat. Main article: Ivory Candypop Bud. Ivory Candypop Buds produce White Pikmin seeds when Pikmin are thrown in. This Candypop can only be seen in Pikmin 2 and is the only method of obtaining White Pikmin. Many Ivory Candypop Buds are found in the White Flower Garden on sublevel 3 when the player has 19 or fewer Whites, and on sublevels 3 and 4 of the Subterranean Complex. Main article: Lapis Lazuli Candypop Bud. Lapis Lazuli Candypop Buds produce Blue Pikmin seeds. They're particularly useful if the player has a small number of Blues on hand and needs to carry a heavy object across a lake. Main article: Pink Candypop Bud. Pink Candypop Buds release Winged Pikmin seeds when Pikmin are tossed in. They can only be found in the Formidable Oak in Story Mode, but are found more frequently in Mission Mode. Main article: Queen Candypop Bud. Queen Candypop Buds are very unique Candypops. Their petals are white with colored spots which flash from red, to yellow, to blue, and back to red. When a Pikmin of any type is tossed in, nine seeds which match the color of the spots are ejected, giving players an eight-Pikmin gain. These flowers are found only in the specific sublevels of difficult caves, usually after a grueling battle with a boss, sometimes referred to as 'rest stops'. Main article: Violet Candypop Bud. Violet Candypop Buds spit out purple seeds when Pikmin are tossed in. This Candypop Bud makes its first appearance in Pikmin 2, and is the only way to obtain Purple Pikmin. Many Violet Candypop Buds and Queen Candypop Buds can be found on sublevel 8 of the Subterranean Complex, making it the ideal location for growing more Purple Pikmin. Some Violet Candypop Buds and Ivory Candypop Buds will only appear if the player has less than 20 of the equivalent Pikmin type. If the player has 20 or more of that Pikmin type, the Candypop Bud will not spawn, and no other object will take its place. This can be seen, for instance, in the second sublevel of the Citadel of Spiders: the Violet Candypop Bud always appear in dead ends, and if the player is over the maximum Pikmin requirements, there will be an empty dead end in the sublevel. Interestingly, only the Pikmin inside the cave and the Pikmin inside the Hocotate ship count toward this limit. This means that Pikmin sprouts in an overworld area, including the area the cave is in, will not count. The game will only check for the requirement at the start of the sublevel. Since the only Candypop Buds affected by this are in early sublevels, this limit likely exists to stop players from easily obtaining a large number of Purple Pikmin or White Pikmin by repeatedly entering and leaving the same cave. In general, Candypop Buds of a specific type will not spawn unless the corresponding Pikmin type has been discovered. In Pikmin, it is possible to go to The Forest Navel and The Distant Spring without discovering Yellow Pikmin or Blue Pikmin, and this causes the Golden Candypop Buds or the Lapis Lazuli Candypop Buds, respectively, to not spawn. Similarly, in Pikmin 3, Candypop Buds will not spawn if their respective type of Pikmin has not been discovered. However, there are some exceptions in Pikmin 2. Purple Pikmin and White Pikmin are discovered after throwing Pikmin inside of a Violet Candypop Bud and an Ivory Candypop Bud, respectively. Therefore, the game must spawn Violet Candypop Buds in Emergence Cave sublevel 2 before Purple Pikmin are discovered and Ivory Candypop Buds in White Flower Garden sublevel 3 before White Pikmin are discovered. For some reason, if the player skips discovering Purple Pikmin in Emergence Cave by utilizing glitches, then other Violet Candypop Buds will still spawn. If it were possible to never encounter Red Pikmin, Crimson Candypop Buds would also still appear. On the other hand, until White Pikmin are discovered, the only Ivory Candypop Buds to spawn are the White Flower Garden sublevel 3 ones. Olimar notes in the enemy reel that Candypop Buds could be the next step in Pikmin evolution, and in his Piklopedia notes that Candypops could be the same species. This theory is further cemented by the fact that Candypop Buds occasionally emit the same sparkles that come from the top of Onions, use similar sounds to the Pikmin, and the buds in Pikmin 3 use the same texture for leaves as the Pikmin do. The name of the plants' family is derived from "candy", given their intense colors, and "pop", referring to the way they spit out Pikmin seeds. Members of this family use the word Flora as the genus in their scientific name, which is simply the English word "flora". Italian Cromanvillea From "bougainvillea", a genus of flowers that resemble Candypops, and the greek root "chromo" which means "color"
The data file on Candypop Buds. A misplaced Candypop Bud in teki5, showing the root. ...but open up if a leader approaches. A Gray Candypop Bud after ingesting a bomb rock. Another picture of a wilting Candypop Bud. After the Candypop Bud wilts, the leaves below it become smaller. In sublevel 5 of Glutton's Kitchen, a Queen Candypop Bud may fall from the ceiling. It is possible to notice that it has a green root. There are also several Candypop Buds in sublevel 6 of Bulblax Kingdom. Here, if the camera is zoomed in, and if the Candypop Bud is distant enough, the root might be visible. In Pikmin 3's Japanese guide book, the colors used to describe the gray and pink Candypop Buds translate roughly to "Slate" and "Amaranth", respectively. Slate is a dark gray, polished substance, while amaranth is a plant that has pinkish flowers. Despite this distinction of color, no version of Pikmin 3 makes any distinction of names, and the new Candypop Buds have yet to be given any official name in any dialect. In Pikmin, Candypop Buds are technically bosses. As such, approaching them will change the area's music to the battle variant. “Could this be the next stage in Pikmin evolution? Like the Pikmin themselves, it has many mysteries.” – Captain Olimar in the enemy reel entry for the Candypop Buds. This page was last edited on March 9, 2019, at 14:35.